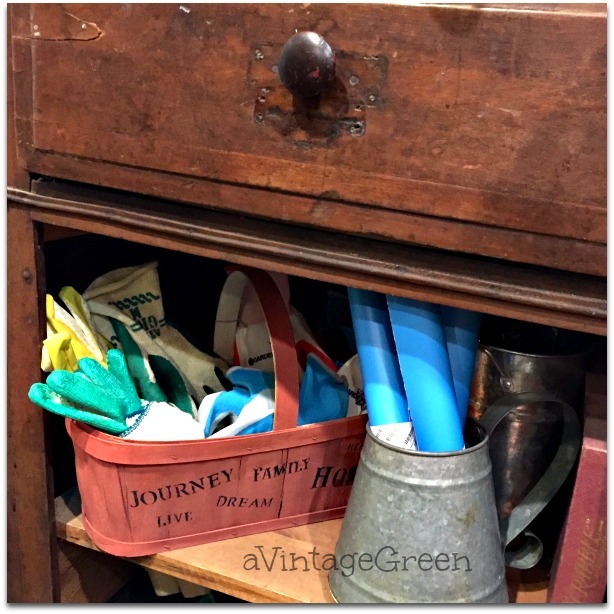 a Vintage Green: Where Do I Put the Garden Gloves? Where Do I Put the Garden Gloves? Small project - find somewhere to keep garden gloves. This is my finished solution. The 'how' is at the end of this post. With garden and garden clean up on my mind I added two spring pictures. 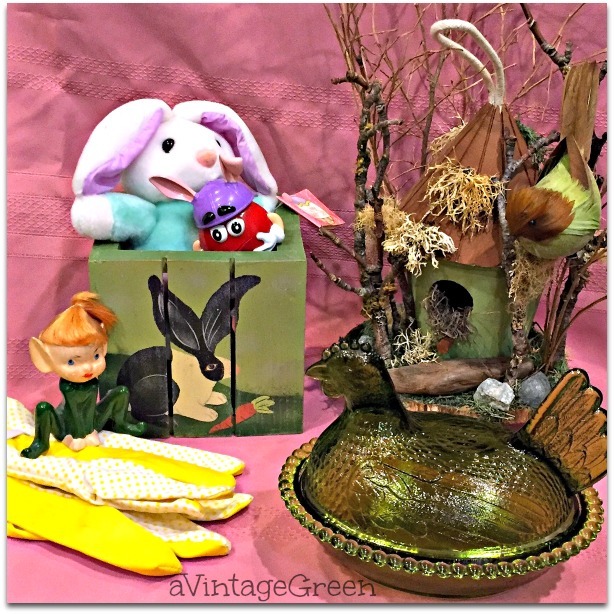 Gathered a few spring bits and pieces. 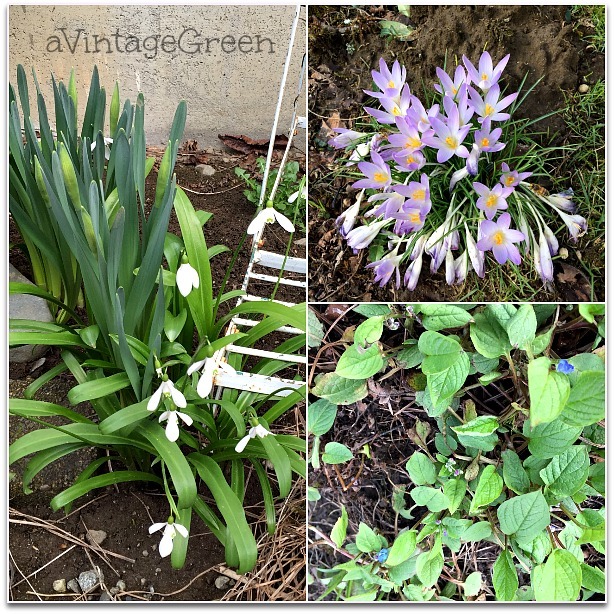 Checked out the backyard and found snowdrops, a sweet bunch of purple crocus and some tiny blue flowers. Visited Costco to pick up a new book (As You Wish by Jude Deveraux) and they had 9 Pack Garden gloves. Did not resist. Problem - where do I keep all those garden gloves? I have 4 other pair that I used last year and they are still ok. A richness of gardening gloves. I tried out a few baskets but they didn't fit in any spaces in the kitchen. Thought about hanging a basket outside the back door - but rain and damp happens. I moved things over on the hutch bottom by the back door to give the basket and contents a home. Took an egg basket I had painted red outside and white inside. It has seen better times. 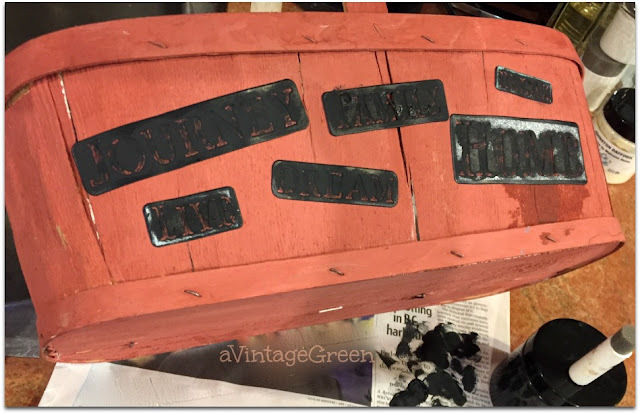 Used 'stick on' word stencils and dabbed them with CeCe Caldwell Beckley Black using a sponge from Martha Stewart. Added gloves along with an ornamental teapot. Added picture from the other end of the basket (with frog). I had my mammogram on Monday - year 5 since cancer was found in one breast (and all that goes with that diagnosis and treatment) and it was very relieving to hear 'see you next year, clear'. So glad you visited today. Clear and see you next year are the best words!! 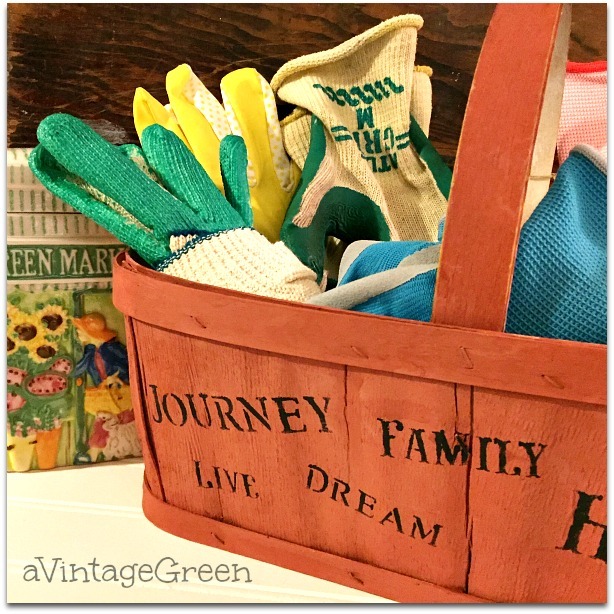 Love the basket, we keep gardening gloves by the front door but don't have so many pairs! so happy to hear, sister dear! So happy to hear about your all clear! The only problem with costco is they want to give you too many of one thing lol but great cute solution. 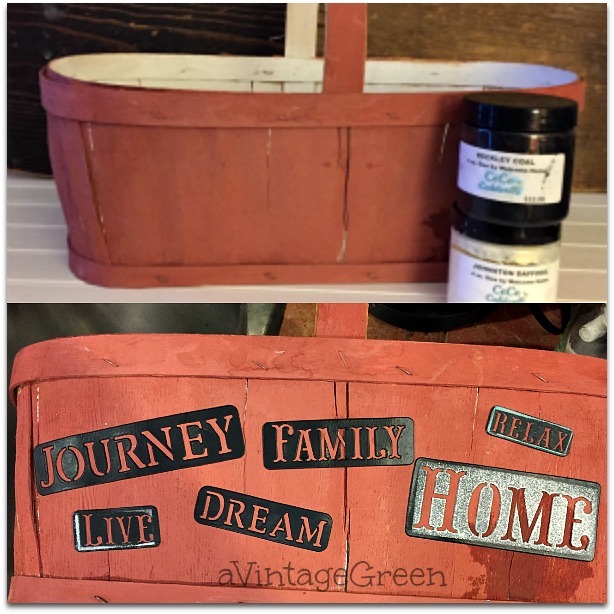 I love your glove basket and will be making one of my own!! Like your blog look too! Cute solution to the problem! I keep mine in a basket too, on the shelves in the garage with all my other implements. I'm so pleased to hear you have the all clear for another year & yay! for the fact we are going to need our gardening gloves soon - spring is coming! What a gorgeous basket. I just donated away a basket like this that I fixed up a year ago. Now of course I wish I had it back. Beautiful job. Clear, see you next year! What wonderful words to hear, so happy for you. 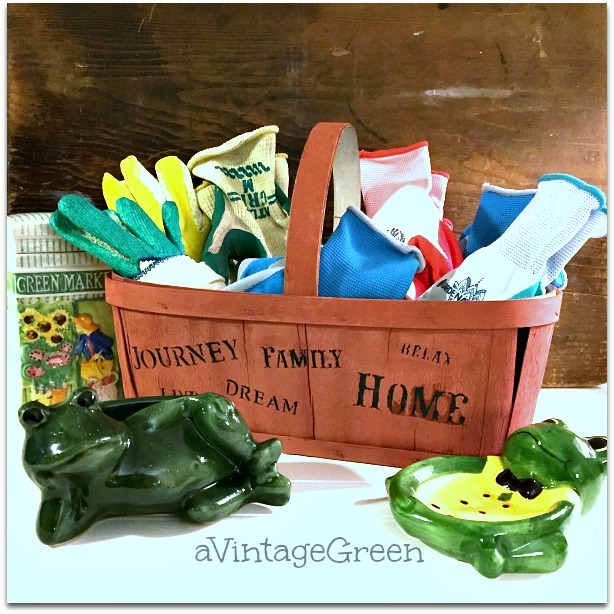 Love the assortment of gardening gloves. I have many gloves but only one pair, time for a clear out and a trip to the gardening centre methinks. Have a great week and enjoy those snowdrops and crocus, soring is around the corner! Excellent news those four little words at the end! 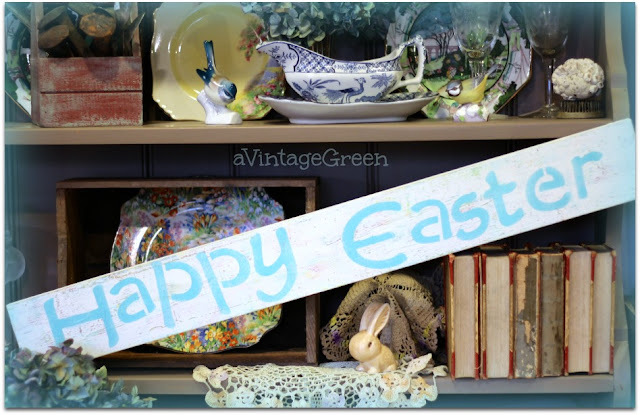 Beautifully creative spring decorations -- just gorgeous. You can't beat a good pair of gardening gloves (or nine of them, even)! And even better when they become a lovely display. Congratulations on the all clear - a relief, to be sure! Good news on your all clear! Love the glove box.. 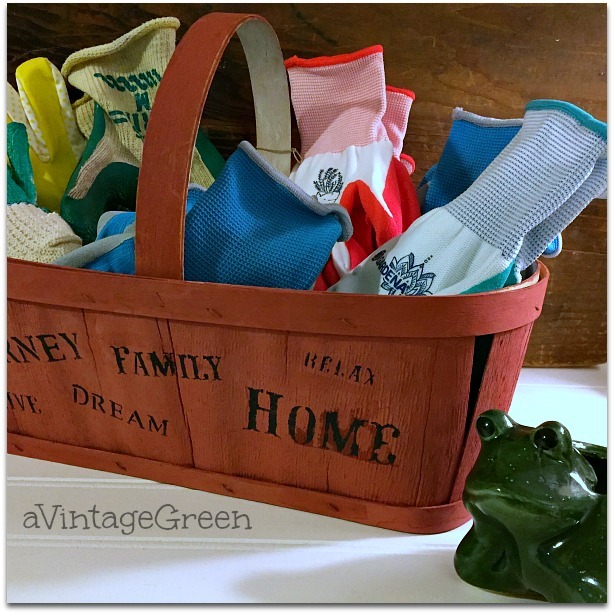 Your basket looks great as a home for your garden gloves. You're getting quite a collection! Great that you got an all clear on your mammogram this year!